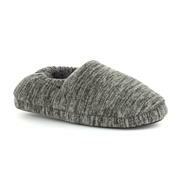 A good pair of boy's slippers helps kids to relax around the house while keeping their feet toasty and comfortable. Whether he's in his nightwear or simply chilling out at the weekend, you'll want to make sure his little toes are warm and cosy. Our range of slippers for boys is sure to delight, whatever his taste. They’re as comfy as can be and available in a range of sizes– but more than that, they will also offer protection against bumps, scrapes, slips and falls. Included here you’ll find boy’s slipper boots, moccasin slippers and novelty children's slippers decorated with much-loved cartoon characters, as well as older boy’s slippers which feature simpler designs. Match any of them up with a set of pyjamas and a dressing gown, and you’re onto a winning combination! Like all of the shoes we sell, our boys slippers are available at very reasonable prices without compromising on quality. Buy a pair of cheap boy's slippers today and you'll get free home delivery and in-store returns too, so you can buy with confidence when you shop online at Shoe Zone. 10 products from £4.99 to £9.99.